Weight gain? Fatigue? Brain Fog? PMS? Menopausal? Discover which hormone imbalances are keeping you from feeling energized, productive and lean, and preventing you from living your life with spectacular vitality. Leave your symptoms behind when you holistically harmonize all of your hormones with my comprehensive approach. If you are looking for a proven professional who can guide you to gain freedom from weight gain, hormone imbalances, cravings and fatigue, you’ve come to the right place. I’m Dr. Karen, and I welcome you! Fed up with weight gain, fatigue, PMS or menopausal symptoms? 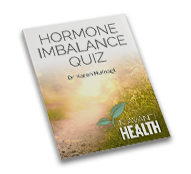 Enter your name and email to receive my free Hormone Imbalance Quiz and start feeling better today! As a bonus, you will also receive my monthly newsletter filled with tips and guidance to keep your hormones happy! This is a transformational, private program designed to alleviate weight gain, fatigue, brain fog, PMS, and menopausal symptoms through improved hormone balance, thyroid and adrenal function. Rooted in evidence-based functional medicine, it provides compassionate care and empowers you with the knowledge and focus needed to accelerate your own health recovery. Using comprehensive diagnostics and evaluation, I pursue and solve the underlying dysfunctions that have resulted in the symptoms you are experiencing. I also take a proactive approach to preventive health care and wellness, so that once your energy and vitality is restored, it remains strong and resilient. Patients I’ve supported in regaining their health have remarkable things to say about the impact my work has had on their lives.